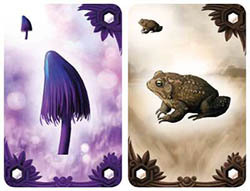 To play Alchemists, you will need the Alchemists app on your smartphone or tablet. 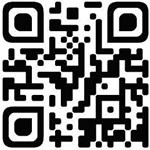 To get the app, scan this QR code. Or enter cge.as/ald into your web browser. The app is free. You've already paid for the game. (To play without the app, see the facing page). Only one device is necessary. Players can share. Once you have downloaded the app, launch it and tap the button. Please enter this four-letter code: DEMO. Congratulations on mixing your first potion! If you followed my instructions correctly, you mixed , which is a healing potion. How is it possible that two seemingly ordinary ingredients could combine to make something extraordinary? Well, it's time for you to learn a little theory. Mixing potions is easy once you know which alchemical corresponds to which ingredient. But we don't know! Isn't that wonderful? So many mysteries waiting to be solved. And so much grant money available for our research. In your first experiment, you discovered that mushroom and toad combine to make . What does this tell you about their alchemicals? There are only 4 ways to make . because these do not have the symbol. Their red aspect is negative. To be a successful alchemist, you need to keep an orderly notebook. The results triangle is for recording the results of your experiment. Take a token and put it at the intersection of mushroom and toad. The deduction grid is for recording what your experiment tells you. 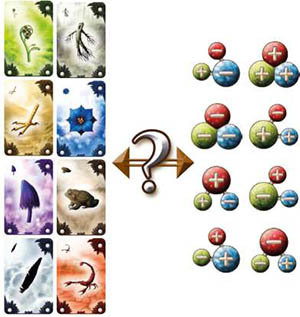 Your experiment eliminates 4 possibilities for mushroom and toad, as shown. In general, you will have to proceed by eliminating possibilities until only one possibility remains. Your deduction grid is for your personal use. You can make notes using any system you want. Each alchemical has exactly one alchemical that neutralizes it. When you combine a neutralizing pair, you get a potion that has no magical effects, although it does make a tasty soup. 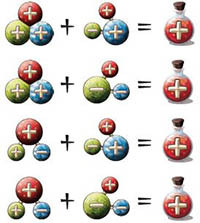 If two alchemicals have no matching aspects, they neutralize each other to make a neutral potion . Do not become discouraged when you mix a neutral potion. Your experiment has actually given you a lot of information. Now you just need to figure out how to use it. 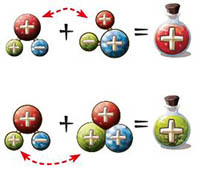 Each alchemical has exactly one alchemical that neutralizes it (It makes a red, blue, or green potion with any other alchemical)..
An alchemical's neutralizer has the opposite sign for each aspect (each color). On your deduction grid, alchemicals that neutralize each other are in adjacent rows. Note the horizontal bands of light and dark shading. And now, my young alchemist, your fundamental training is complete. Well, complete enough. I have to get back to work. I wish you much success in all your endeavors, and if you should ever happen to publish an important discovery, be sure to give proper credit to the alchemist who taught you everything you know. At alchemists.czechgames.com, you can find a web-based version of the app. On the web, cards are selected by hand. If for some reason you want to play Alchemists without using an electronic device, one person can play gamemaster and act as the card reader. 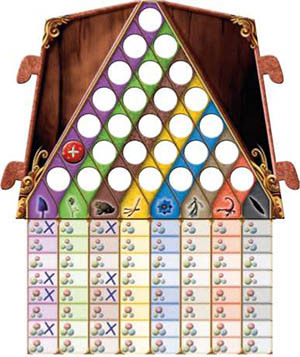 The gamemaster can use the box lid to keep the gamemaster triangle hidden from the other players. 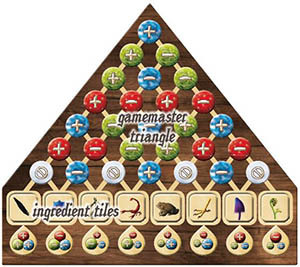 The gamemaster mixes up the 8 ingredient tiles and inserts them secretly and randomly into the 8 slots. The gamemaster does not need to worry about the actual alchemicals. The result of mixing any two ingredients is given by the triangle. The gamemaster handles every situation that normally requires the card reader. For example, whenever a player needs to "scan" ingredient cards, the player passes the cards face down to the gamemaster. The gamemaster looks up the resulting potion and then gives the answer that the card reader would give in that situation. The gamemaster can then put the ingredients in the discard pile. If the battery on your smartphone dies and you want to use the gamemaster triangle to finish your game, just convert the four-letter game code to an ordered list of 8 ingredients using this simple algorithm: ... Actually, on second thought, maybe we should keep that information to ourselves. But if you know the battery is dying, someone who isn't playing can take the role of gamemaster by peeking at the answers in the app and setting up the gamemaster triangle accordingly. This gamemaster triangle is set up so you can "scan" all three examples on this page and give the same answers that the card reader would.